Any card player using the cheating cards with contact lenses is comfortable while wearing the contact lenses can opt for the latest poker marked cards belt device available at HR Tash Company store. This camera device is also used for scanning the markings on the cards and cheat with the opponents. A mini size camera with an IR lens is customized in the device for scanning cards. 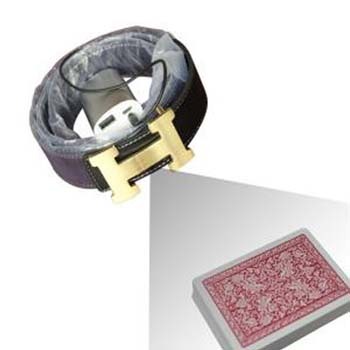 Poker belt scanner device is customized by professionals using the latest technology equipment to keep it hidden from the opponent’s eyes. Scanning range of these scanning marked cards with leather belt camera device can be upgraded according to the camera lens specifications. Information reported to the user is easily accessible on the mobile phone and wireless earpiece bud in the ears.